wedding bouncy castles. Fun for everyone at the wedding! Wedding White 15x15 Bouncy Castle Hire for London, Kent, Essex & Hertfordshire | Rental for Weddings. Jump for joy on such a special day. Nothing is better than entertaining the little kids (and the drunken big ones) on a perfect evening. Our wedding white bouncy castle hire is the perfect addition for that lovely summers evening. Not only does a bouncy castle for your wedding entertain, but it also makes for great photo opportunities. Book your bouncy castle today! If your looking for that WOW factor on your evening our wedding white bouncy castle is the answer! We are convinced that our castles don’t just create entertainment for the guests of all ages, it also makes for the most amazing photo-taking opportunities. 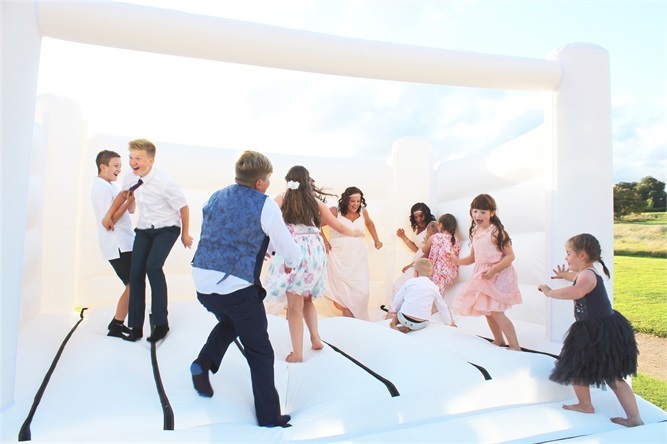 Our wedding white bouncy castles are the best addition to a perfect evening to really make your guests feel like they are at a special event! Wedding Bouncy Castles for Essex are the must-have for your evening entertainment and as OMG! specialises in making sure your evening is one to be remembered, you can count on us to bring the fun and laughter. Now, Photo Booths are what we do best, but with a sister company that is one of the largest bouncy castle companies in the UK we thought we could take what we’ve learnt and applied it to make your day much more memorable. A White Bouncy Castle is a perfect way to keep everyone entertained and a unique idea to break down the evening to keep your guests talking for months to come. Each hire is different so please get in touch with the team to discuss how you can have our beautiful Wedding White Bouncy Castle Hire for your big day. 0800 234 3447… we won’t bite!